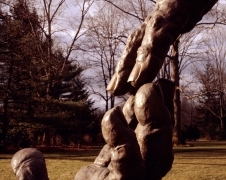 “Touch” depicts the very beginning of the movement: the hands have not yet locked and are barely in contact. The uncertainty adds mystery and tension: the touch may be lost. At the same time, the minimal touch between the two adds an unexpected lightness. The upper hand floats in air, and the lower one is hardly anchored to the base. This adds whimsicality and wonderment to the massive sculpture. It brings on a sense of optimism and sends out the message that the world is full of promise.